Like every week I can’t wait to see the submissions on Yeastspotting. They are inspiring, even though my long list of “bread to bake” is growing. But, I’m patient and a week has 7 days; so, I can bake a lot. And we love bread. 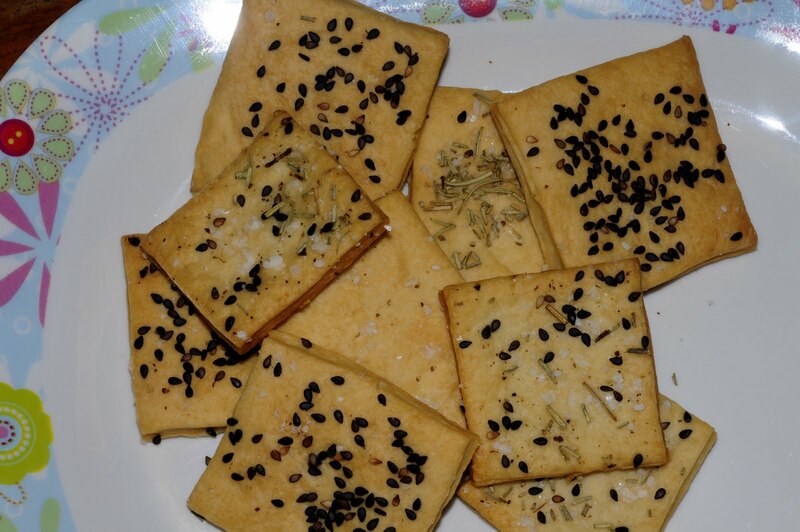 This week I saw the tasteful looking crackers made by Julia @ Mélanger. 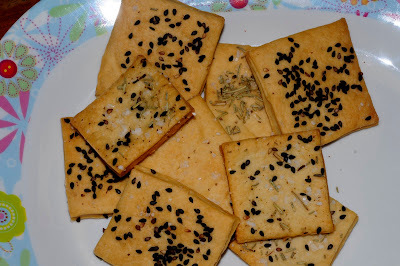 While I was waiting for my sourdough starter to grow enough I made these delicious crackers. This was the first time I baked them, but certainly not the last time. We loved them. I had to put them in a plastic container before Peter ate them all. I played a bit with the toppings, some with black sesame seeds, some with sea salt, some with dried rosemary and for the the rest I mixed the toppings. We liked them all. Peter suggested for next time to make some bigger ones without topping so we can eat them with our home made peanut butter of jam; good idea. I mixed the flour, yeast, salt, baking soda and sugar until well combined. Added the water and mixed for a few minutes. Than I added the olive oil and combined all well. The dough will be a little crumbly at this stage. Knead for a few minutes until the dough comes together nicely and starts to look silky – it took me more than a few minutes. I placed the dough in a lightly oiled bowl, covered with plastic and left in the refrigerator for the night. The next day; preheat the oven to 160˚C/320˚F. Take out the dough and divide into two pieces. Roll the dough out as thinly as possible (e.g. around ¼ – 1/3 cm thick or 1/8 inch thick). I rolled it out until it had the same size as the baking stone. Place the rolled out dough onto parchment paper and then cut into your desired squares/shapes. With a fork, prick each shape a few times, and then spray the dough lightly with water and top with your choice. Bake for around 12-13 minutes depending on size, remove from the oven and allow to cool. Store in an airtight container or just eat them all that evening and the next day like we did.